St John's College was founded in 1511 by the executors of Lady Margaret Beaufort's (mother of Henry VII), will. It was built on the site of an old hospital and the hospital chapel stood until it was demolished in the 19th century. The college originally only admitted ordained priests to continue their theological studies. 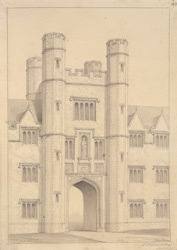 Part of the college was used as a prison during the Civil War (1642-1646) when St John's was a Royalist stronghold in a town that was staunchly Parliamentarian.